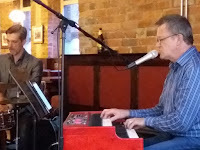 A no-nonsense gig...set up, reposition/requisition a few chairs, switch off the muzak, likewise the wall-mounted tv screen (tennis from Cincinnati) distractingly directly behind the musicians then hit the road with an uptempo Days of Wine and Roses. Yeh, Yeh kept things cookin' as Stu Collingwood readied himself for a vocal on Georgia. 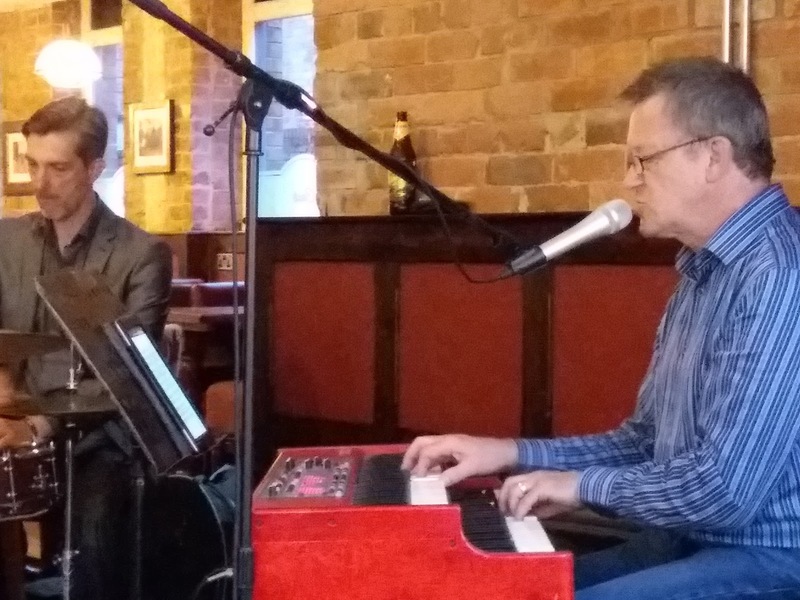 The north east boasts a plethora of fine pianists, yet it is only recently that Paul Edis has exercised the tonsils in public, now Stu, although one suspects he's been singing on gigs for many a year. So, this begs the question...how many of our piano men and women sing but haven't got round to it? You know their names, next time you see one of them request a vocal number! 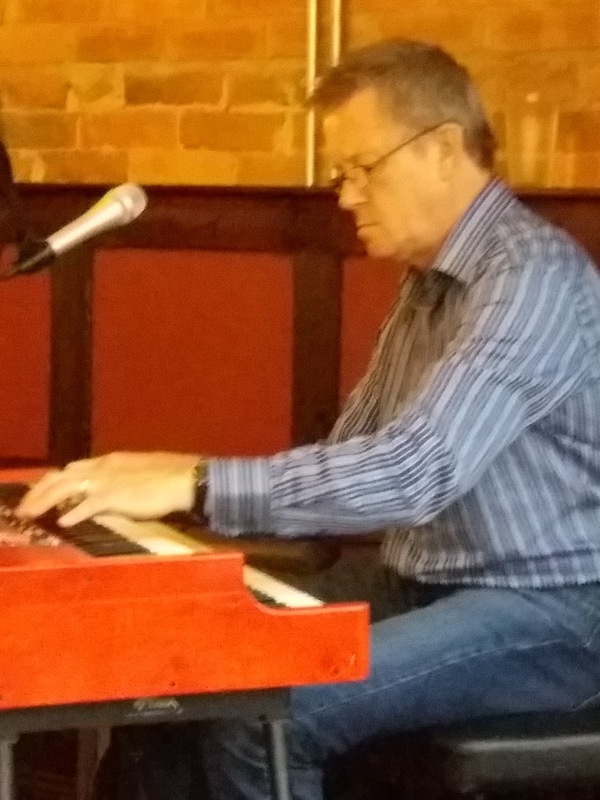 Any self-respecting (Hammond and its variants) organist puts the boot in with some Jimmy Smith and Stu showed due respect Back at the Chicken Shack. The other half of the duo - drummer Russ Morgan - knew the material alright, a nod, a glance sufficient to knock a succession of fours to the boundary or close it out. In the main familiar faces occupied the front row seats including Jazz Café regulars Ahmed, Ron, Pam and Dave. The rain hammered down onto the conservatory roof yet it only became apparent during the interval with Stu's Nord C1 momentarily silenced! In a Mellotone resumed matters, Affirmation, popularised by George Benson, kicked on, handing over to Joe Zawinul to cry Mercy, Mercy, Mercy. The organ-drums format goes way back and Stu and Russ clearly enjoyed their set - if it's good stuff, why not play it? Of course, a steamin' tempo works a treat on a gig like this and The Cat - yes, Jimmy Smith - tore it up, Nice Work If You Can Get It did the same with another vocal from Stu, and, hang on to your hats, you cats... C Jam Blues - what a killer! The Girl from Ipanema called in just in time to hear Collingwood and Morgan end an excellent set with a smokin' take on Chick Corea's Got a Match? The next duo gig at the Dun Cow is scheduled for Wednesday, August 29 with the brilliant Mark Willams and Joel Byrne-McCullough playing a jazz guitar set. Next week in Branding Park (August 22) it's jam session time led by the irrepressible James Harrison.